The imaginative power of Wordsworth’s poetry stems from a denial of history so strong and precise that denial itself – the determined absence of history – must be studied as positive fact. The author argues this thesis with the aid of substantial methodological innovations allowing the best of formalist, deconstructive, and New Historicist reading strategies to be synthesized and informd by a wealth of historical matter. Drawing upon recent advances in the history and theory of the French Revolution, art history, economic history, family history, and the social history of the Lake District, he shows that history – however absent it seems to be – influences literature deeply at the level of form. In particular, the most telling register of historical change and perception in Wordsworth’s poetry is generic transformation. Studying the works of the early and middle years intensively, and the later works suggestively, the author argues that Wordsworth’s overall shift from description to narrative, and from narrative to lyric, is a mimetic denail of contemporary cultural history. By the time “imagination” invests lyric imagery, it has learned to capture history within an empire of self that is no less than a surrogate history, a facsimile ideology. Part One of the book introduces the subject by rereading the Simplon Pass episode in The Prelude as a denial of Napoleon’s Alpine crossing of 1800. It then formulates a methodology of historical reading by witnessing in the modern and postmodern notion of “context” a developing collaboration between formalist and materialist perspectives. The “matter” of history, the author argues, is collectively structured, witnessed, and uttered absence; and the reading of history is therefore a discrimination of forms of absence. When a city or a cottage is effaced, there is left only the nothing that is the constitutive basis of conventions of difference – of hate, prejudicial discrimination, “nation,” “culture,” and, as one of the most discriminating of cultural discriminations, the differential forms of art. Part Two draws upon art history, political history, contemporary journalism, and narrative theory to study the formal collision between Wordsworth’s early picturesque and the predominantly narrative mode of French Revolutionary violence. 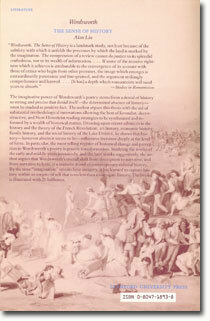 Out of this collision, “time” arose as the massive denial of history, giving the poet his first authority separate from the “People.” In chapters entitled “The Tragedy of the Family,” “The Economy of Lyric,” and “A Transformed Revolution,” Part Three traces the development of authority into the “originality” of the poet’s mature ideology of autobiography. Part Four concludes the work by pointing ahead in Wordsworth’s corpus toward “The Idea of the Memorial Tour” and the self-critical stance of a poet whose quintessential act was to “collect” himself. The book ends with a brief epilogue on history and critical self-consciousness. Such has been my criticism of Wordsworth. Where Blake said that Milton was of the devil’s party without knowing it, I have criticized Wordsworth’s history lost by saying that the poet was of history’s party without knowing it. Indeed, the precedent of Blake is prescriptive for the last movement of criticism I would now initiate. Where Blake in Milton then revived Milton to make him redeem his own past work, I wish to conclude my project by summoning up for my poet a similar afterlife. I wish to remember the later, imaginatively “dead” Wordsworth who, in the view I will argue here, sacrifices part of his original self – his imagination – to redeem part of history. To redeem a poet able to redeem his lost history, of course, may see a strange task of harrowing after a series of chapters whose net result is arguably demystifying: a nailing up of the poet on the cross of the historical world that, in the act of pointing out the stigmata where political, social, and economic history have penetrated, refuses to acknowledge any of the poet’s saving fictions of transcendence except in distancing quotes – as if hanging up an accusation, “This is Wordsworth, the King of the Imagination.” However, there still remains a final saving fiction – no less than a counter-ideology – in the poet’s corpus: his faith that transcendental imagination can at the last recollect history. Illusion such recollection may be (for, certainly, the later poet is surfeit with German Ideology), but to refust to allow this counterillusory illusion even the possibility of credence would, in my view, be to leave our task of criticism incomplete. It would be to remove the possibility that Wordsworth was his own critic. Criticism would make it new, I have said, by opening up to view the interval of difference between a work’s assumptions and other works, other assumptions. Most crucially, it opens up the interval between then and now and, in so doing, creates the essential space of the hermeneutical problem: the epochal divide between the other and the same that is the aporetic ground – the ultimate “two points” in my tour model – of historical understanding. Much of our current New Historicism is a conscious attempt to hold the gap open as long as possible in reaction against historical methods that have too forcefully interposed ideal, material, or positivist continua (a Geist or material determinant, for example). Thus in their related ways, the Foucauldian history of discontinuity, the neo-Marxist emphasis on differentiation and distantiation, and the “Representations-school” accent on “the impossibility of fully reconstructing and reentering the culture” of the past all pry apart the sides of the raw gap of history to prevent any too-easy credence in an interstitial “subject” able to heal the wound: spirit, consciousness, imagination, man, people, nation, humanity, and so forth. As I have said about my own methodology, such new history is thus radically skeptical in its ontology but positive in its displaced locus of epistemology. It would know with precision not so much the historical other across the divide as the shape and dimensions of the divide itself together with the imprint of such impending division, or become within the other – a palpable absence, we may say, like the track of a blade after it has left the wound. But though we do not want a too-easy regeneration of the flesh of “humanity” in the wound or stigma of history, neither do we desire the scarring, thickening, and coarsening that endangers all the demystifying strategies of New Historicism. I refer to the potential for adversarial dogmatism that resides in all such strategies, including my own: a too inflexible and hardened preference for marks of difference. Put simply: all difference discovered between then and now, as well as all marks of difference observed within the then itself, threaten to become the same. Difference becomes the source of the same limited range of responses – Foucauldian laughter, wonder, shock, and, above all, irony. These responses are always just short of admitting those other affects – empathy, sympathy, identification – that, while insufficient in themselves, are nevertheless necessary to the span of understanding. Or to subtract the metaphor and the language of affection I have called up in using my metaphor of wounds and stigmata: the logic of the hermeneutical circle is indeed inescapable. For historical understanding to be possible, a certain overlap or “foreknowledge” of the past within the present is necessary; and any critical method that holds the present and past (as well as the polarities within the past) too immaculately apart for fear of cross-contamination is not a possible method of critical understanding. In short, irony – the greatest of the holdovers of New Criticism and deconstruction in the New Historicism – is not by itself criticism. How can historical criticism prevent itself from hardening into (in)difference without inventing a new Geist or material determinant to fill the breach between the other and the same, the past and the present? The answer, it seems to me, is to identify with the past in the carefully constrained sense of giving it the benefit of a doubt. If criticism observes the differences between a work’s assumptions and those of other milieus (differences that allow us to see its ideology), then it should also seek – in Althusser’s phrase – to discern some slight awareness of that interval of difference within the work itself as the work’s “internal distantiation” (Lenin, p. 204). Criticism should discern not only historical difference and its forecast in the self-divisions of the past, in other words, but also the purely provisional, self-critical awareness that forms around internal distantiation as the past’s own worry over the fact that it is not simply itself. Such is the past’s sense of history: its own, barely emergent awareness that it is at once an ideological formation (what de Man in his work prior to the articulation of irony denominates “intent”) and a state historically distanced from, in excess of, or otherwise differentiated from its formative intent. Only the surmise of a prior sense of history, it seems to me, can complete the act of critical understanding. For it is precisely the ability to give the past the benefit of own’s own doubt – to bracket and so make room for the possibility of previous demystification – that enables the essential overlap of foreknowledge between then and now, the work’s own wrestle with historical understanding and ours. In the end, of course, it is not the discovery of prior demystification in itself that is necessary (especially since the circus-animals’ desertion of a poet’s self-demystification always has the potential to become a new mythology) so much as the discovery during criticism of some such second horizon of interpreting the poet. We need, in effect, a horizon-over-the-horizon, where the self-differentiation that is the past’s sense of history and the self-differentiation that is the present’s sense of history may fuse without either selves or historical worlds (bounded by the first-order horizons) also being thought to fuse. Or to change allusions: at the moment when our Quixote, in the very fever fit of illusion, sees through fiction to mirror ourselves as critics of fiction, who would not look away? 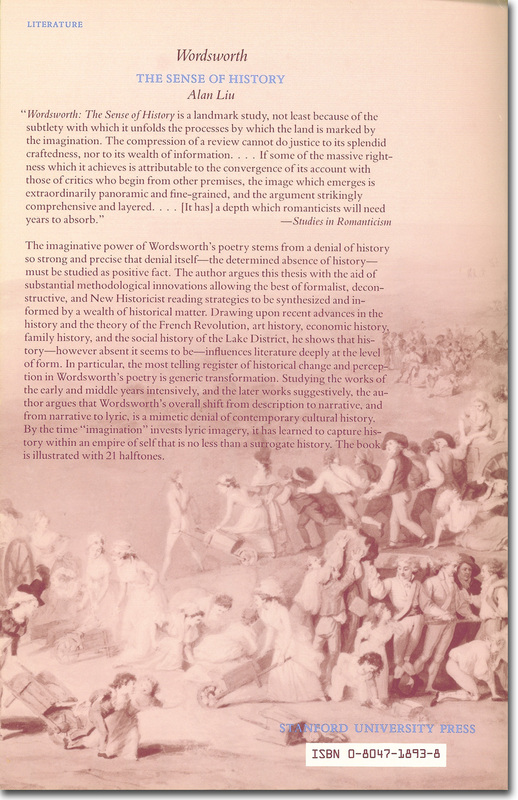 In the criticism of Wordsworth, in sum, we require at last an overlap of horizons that will not be Romantic ideology but anti-Romantic ideology: an exploratory identification with the poet’s own later effort to criticize the flight of imagination and recover history once more. This, perhaps, is the toughest test for any historical critic of Wordsworth and Romanticism. Are we able not only to criticize-by-difference the denial of history creative of Wordsworth’s most imaginative work but also to criticize-by-identification the restitution to history responsible for his later, disimaginative work? Can we recognize, in other words, that our criticism of imagination reproduces in itself the unimaginative flair of the poet’s later work with all its dutiful remembrance of historical and institutional forms (nation, church, people) and all its reduction of imagination to occasional moments when he (and we) are surprised by joy? We can finally understand our King of the Imagination, I have suggested, only at the moment of his own forsakenness. But in that moment when his act of seeing through imagination mirrors ours, are we not also foresaken? Or to change allusions: at the moment when our Quixote, in the very fever fit of illusion, sees through fiction to mirror ourselves as critics of fiction, who would not look away? Criticism can never end its effort to turn the windmillings of illusion into the counter-windmillings of the hermeneutical circle, of understanding. But it loses heart, grows tired, submits to the authority of its own historical moment ant the ideologically determined priorities that command, to take the most pertinent example, “This book must be finished now.” Thus it is, perhaps, that criticism itself needs saving fictions. I close my tour of Wordsworth’s poetic beginnings, then, upon the fiction that I merely open the book on the poet’s imaginative ending and recollection of history (though I know I have not heart or years enough to read this book). I close upon the many Memorial Tours, Itinerary poems, and related sequences – including the River Duddon and Ecclesiastical Sonnets – that are the dominant form of the later poet. Or rather (another saving fiction), since I cannot here explore the whole of these later works, I offer only a wild surmise of the pacific reaches.